Pomp Productions was contracted by Team Digital to provide strategic consulting, planning, technical development and live support for the 2015 MasterCard Rugby World Cup “Man of the Match” digital initiative. 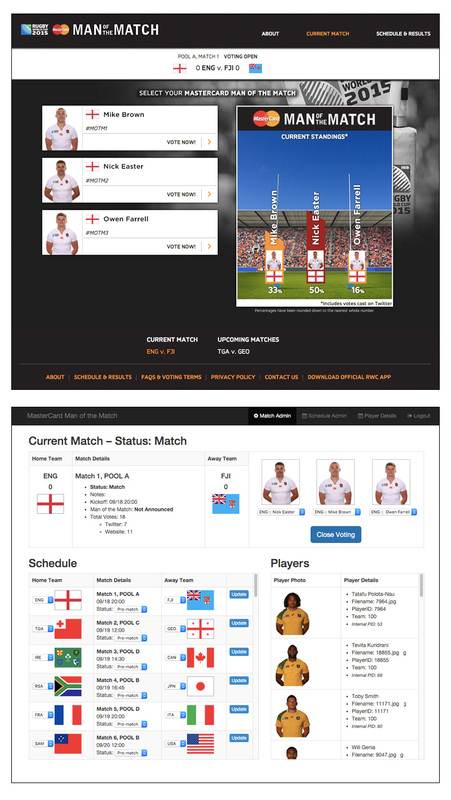 The project included a proprietary CMS which provided World Rugby commentators real-time functionality for nominating players for “Man of the Match” voting throughout the 48 game tournament. Fans around the world cast votes through Twitter, online and through the Rugby World Cup mobile App. The CMS allowed World Rugby to control the voting experience across all platforms and receive real-time vote results and notifications. The consumer experience was available in English, Spanish, French and Japanese. It included real-time game scoring, live voting and fan vote results. The experience was available in a mobile responsive website, within the Rugby World Cup mobile App and on kiosks in Fan Zones throughout the stadiums. Pomp architected the AWS Cloud infrastructure for the project which included load balanced EC2 web and automation servers, ElasticCache memcache servers, an RDS database and SES email for CMS alerts and notifications.